Happy Birthday to Moo | CowParade New Figurines | One Price Low Flat Shipping! 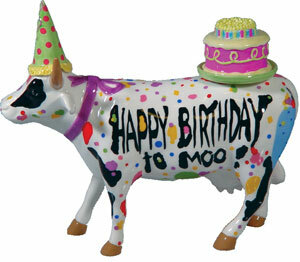 From the CowParade Medium Figurine Collection, Happy Birthday to Moo. Designed by artists, Mike Dowdall, Humberto Castro Cruz, and Juan Andreau. Made of resin with glossy finish. Measures 4" x 6". Featured at the CowParade West Hartford 2007 exhibit. This fun cow figurine has a birthday hat on its head and a cake on its back along with a purple bow painted around its neck. Adding to this celebration cow's festive feel is that it is dotted with colorful confetti!